The blind hem stitch is one of those finishes that you see in many professionally made garments and draperies. It boggles my mind that more home stitchers are not utilizing this simple stitch more. Today, let’s demystify the process and let me show you just how easy it is! 1. 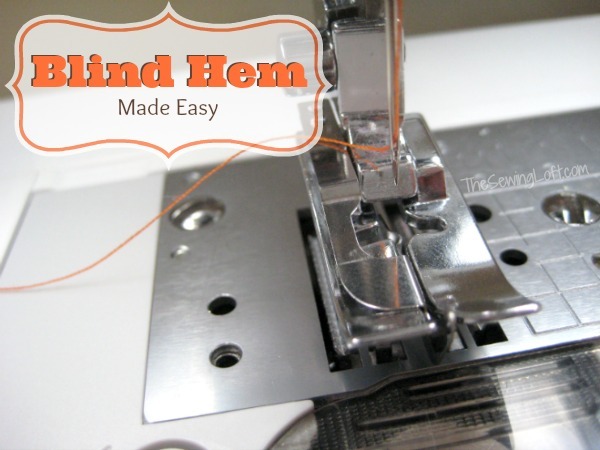 The first thing you need to do is find your blind stitch foot; also sometimes referred to as “R” and your blind hem stitch setting on your machine. Refer to your sewing machine manual. 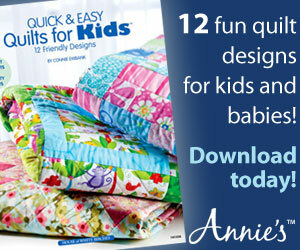 Depending on your fabric you will select from the standard blind hem stitch or the blind hem stitch stretch. 2. Prepare your hem line. I like to clean finish the edge with an overlock stitch. 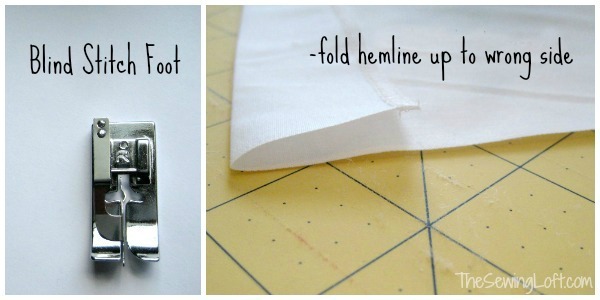 Fold up your hem -wrong side to wrong side and press. 3. 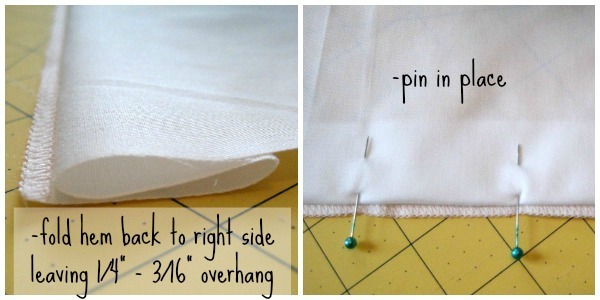 Flip hem back to right side leaving 1/4″ to 3/16″ over-hang; finger press or pin in place. 4. Set machine to correct blind stitch for your fabric. Line up the guide bar on presser foot along the fold line of hem and stitch. You will notice that every few stitches the needle will jump to the left side to catch the fold. This is creating a pick. 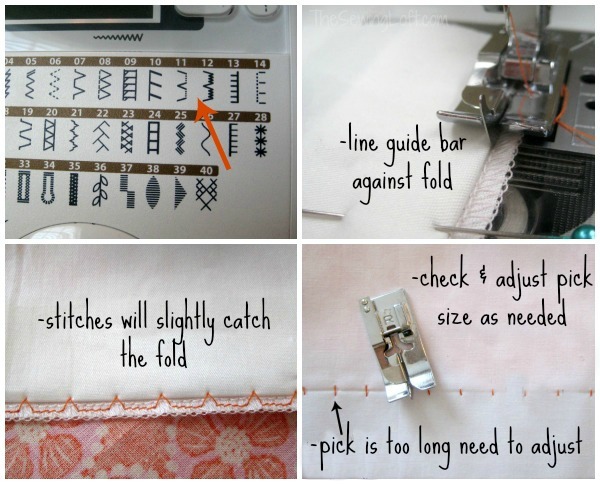 Tip: Decrease the stitch width if the needle picks up too much of the hem fold. Increase the stitch width if the needle does not capture enough of the hem fold. 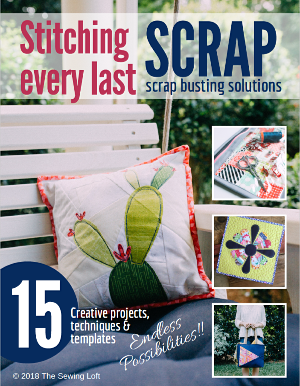 Use coordinating thread or dyed to match thread to allow the blind stitching to disappear into your project. Now are you wondering where all those extra accessories are that came with your machine? Well, no worries if you can not find the blind stitch foot. You can still create this invisible hem line with some practice and your standard presser foot. Remember, practice, practice, practice! Bookmarking this! Blind Hem has always confused me. My Singer book doesn’t explain it as well as you did here. I’m going to try it on a linen dress I’m making this week. thanks for this lesson, have never tried to use this foot, I have always hand sewed hems, been sewing for many years but have had this machine for one year and many attachments that I have no idea how to use. Very clear directions and useful information. You make it look very easy! I love the blind stitched hems, and use them on everything . . . but like Mariella Girard, I’ve always done my hems by hand. . . well, almost always. I did try a blind stitch hem on my sewing machine once. I don’t remember what went wrong, but it wasn’t to my liking and took more time than just doing the hem by hand would have taken. Since then, my hems are hand sewn without question. Thank you for this post! I pinned it and will come back to it when I need it! I’ve always been curious about learning to do this with my machine. Where was this tute a couple of weeks ago??? I had to figure it out on my own! I’m pinning this for others, this is a tricky stitch but so worth it! AAUG, Total bummer! I always have to do a recheck when sewing this type of hem. It just seams so strange to stitch this way but I love the way it looks. Thanks for the pin. ps- I am LOVING the Chambray skirt! I have some solid cotton that is crying out for a style like this! This is great. I’ve been wondering what that foot and all those cool stitches in the manual were for. Now I need to find a project to try this on. I was wondering if you could help me out because I don’t know what would be the best kind of thread for a blind hem on say a suit bottom. Please help if you could.